I lied to him, probably the first time in my life that I love someone else. So that he could quit all his hopes, move on and live a free away from my memories..
..or maybe I because I felt I'm sinking when I met him after years. I felt the pain I've gone through for so long. I felt like something is drowning inside me when he was sitting in front of me and smiling. He wanted to get it all back what he left a long time ago but it cannot just happen. Time changes people, I was changed, I stopped loving, I couldn't love anymore- anyone, not even him, when he tried coming back. 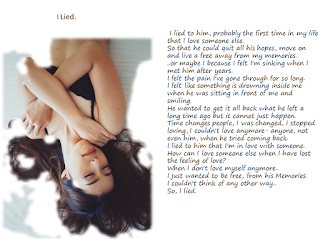 I lied to him that I'm in love with someone. How can I love someone else when I have lost the feeling of love? When I don't love myself anymore.. I just wanted to be free, from his Memories. I couldn't think of any other way..